This cover must have torn off early on. All of the books in the set disintegrated pretty quick. They were very cheap paperbacks. In any case, I have no distinct memory of this cover. 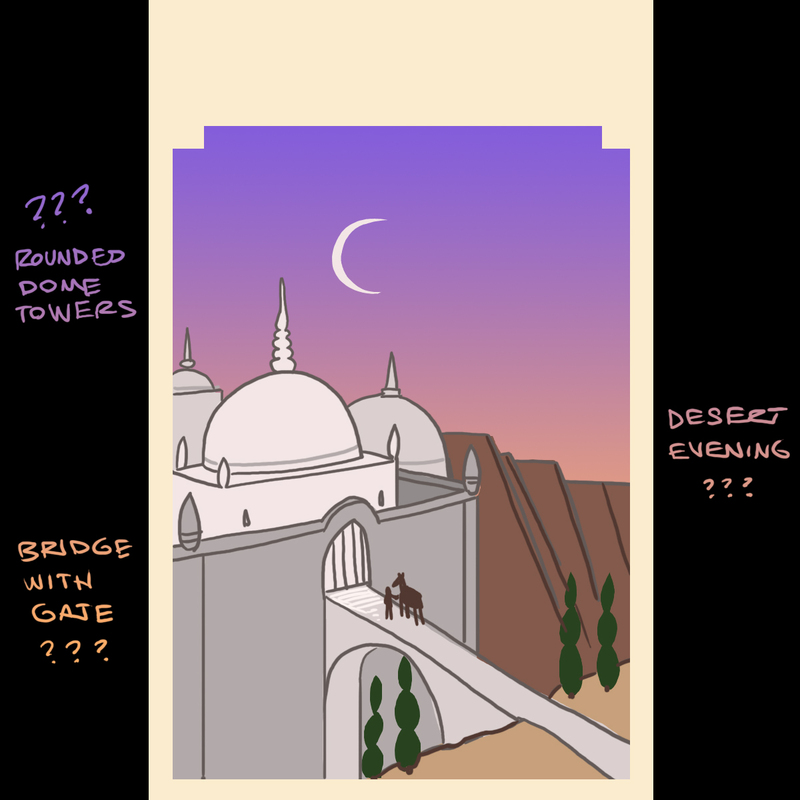 If I really think about it, I can conjure this bridge with a city gate and some domed buildings. It could be an interior illustration for all I know. But it's all I can recall, so here it is. Next to nothing. Here's what I can come up with: The horse and his boy go to a middle-eastern type of city. The land of the Telemarketers, no, the Telgemeiers (no, that's a graphic novelist) the Targaryens (no, wrong fantasy series) the Tralfamadorians (no, that's Kurt Vonnegut) it was......................the Land of the Telmarines! Boom! You didn't think I could do it, did you? The land of the Telmarines. It was a middle eastern city with no Narnians or talking animals. There was an evil(?) ruler who had to be referred to as "______-may-he-live-forever." I can't remember the name, but he had to have the "may-he-live-forever" at the end of his name. And that's all. If there were English children in this book, I don't remember them. When this is all over, please go read this book again. Please. What I remember from the cover was the palomino horse. sorry for the spoiler yesterday. I love the T names you threw out there. Nice recall! Oh, and the colors. You did good with the purple. Has anyone looked at the new book covers they are doing? Lame. They look like crappy digitized photos from the movies. I haven't seen the new covers, and I can't look them up, in case I accidentally see the old covers. Ditto to what Q said. There aren't any Telmarines in this one, and it takes place while Peter, Susan, Edmund, and Lucy are kings and queens in Narnia (though the land of T--- isn't in Narnia). I loved this one. I loved this book. At one time, it was my favorite. true story.